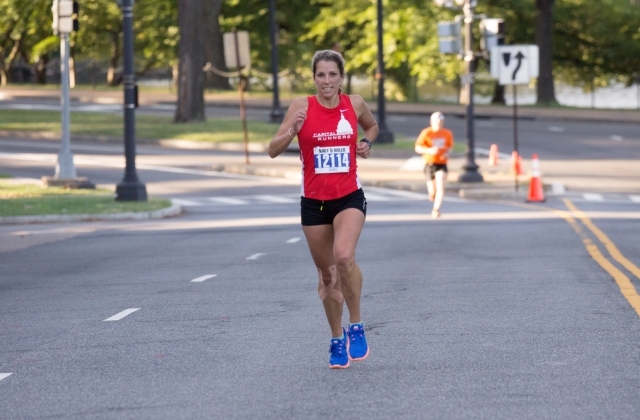 Many runner notched new personal records – and broke some course records as well – on a beautiful morning at the Navy-Air Force Half Marathon. [button-red url=”http://www.zippyraceresults.com/search.php?ID=4284″ target=”_self” position=”left”] Half Marathon Results [/button-red]Erin Taylor, who runs with Capital Area Runners, had hoped to finish in the top three, but ended up winning the half marathon for the women in 1:20:36, getting a new PR and breaking the course record, despite running much of the course on her own. Taylor is training for the Marine Corps Marathon at the end of October, and said she hopes to be able to tuck in with some other women and not spend any of the race by herself. The half marathon course begins by the Washington Monument and goes along the mall before about a two mile out-and-back on the Rock Creek Parkway. After crossing the Memorial Bridge, runners retrace their steps into the city and make a loop around Hains Point before finishing at the monument again. For Taylor, the best part was the run in Rock Creek Park. “I thought I would hate it because it’s the big hill, but it’s actually really beautiful there, it made it really nice,” she said. Patrick Fernandez, also from Capital Area Runners, took the top spot in the men’s half marathon in 1:07:54, just two seconds slower than the course record he set last year. The active duty Coast Guardsman used Sunday’s race as a physical and mental tune up for next month’s Eindhoven Marathon in the Netherlands, where he’ll race with the armed forces marathon team. Both the male and female top masters finishers also set new course records. Thomas Adam, who runs for Ragged Mountain Racing in Charlottesville and won the 5 miler, said he planned to stick with a members of the Georgetown Running Club at the start, but slowly pulled away in about the last mile. A highlight of the course for Adam for the loop around Hains Point, though other runners said they were bored during the three mile loop. “It’s kind of relaxing and calming being on that loop because it’s quiet, you’re near the water, it’s a beautiful day. So I just tried to focus on staying relaxed,” he said. Following his win on Sunday, Adam will be back in D.C. for the Army Ten-Miler in early October and is also training for the Indianapolis Monumental Half Marathon in November. Maura Carroll, who runs for the Georgetown Running Club, won the 5 miler for the women in about 30 minutes. While she was happy with her time, she said she wished there have been more people with her during the race to pull her along a bit faster. Carroll was one of the people who missed the early start of the 5 miler in 2013, but said everything went smoothly at this year’s start. Her next race will be a 10k in Pittsburgh later this month, then the Army Ten-Miler in October. Jeff Lewis, an Army veteran who competed in the wheelchair division, said when he stopped peddling a few times during the race, he realized that his muscles were tightening up in the cold. That motivation to keep peddling – as well as staying focused on the police motorcycle ahead of him – enabled him to win the 5 mile wheelchair division. Lewis was racing in honor of Private First Class Adam Marion, who he served with in Iraq. Nathan Nudelman, the coach of the Naval Academy Marathon Team, brought 19 students to the race from Annapolis for their last tune up before they end the season at the Steamtown Marathon in Pennsylvania in October. One of them, Greg Marshall, a senior at the Naval Academy, ran the five mile race Sunday as part of the taper for the upcoming marathon. While the schedule at the academy is demanding, Marshall said it’s not a burden to fit in a run at the end of a long day. “I kind of needed it. It’s great to go to school all day and have that stress you out, then hang out with some of my best friends, get a good run in. It’s definitely a good escape,” he said. After the race, Adm. James Winnefeld, the vice chairman of the joint chiefs of staff, who ran the half marathon, spoke with the Naval Academy students about his 36-year career in the Navy and as a runner.